I owe a birthday post since we now live with a four-year-old, but have neither the pictures uploaded nor the energy tonight to recap T's big birthday adventure. Tonight's birthday update will be simply that we managed, in one Sunday afternoon, to unknowingly expose about two dozen kids to strep throat since Andrew was on the couch with a 102 fever just a few hours after returning from Thomas' festivities at the local gymnastics academy. That, my friends, is how sickness spreads like wildfire. In the meantime I'll post a short follow-up to my last Outtakes post. We celebrated Great Grandma Sarah's 89th birthday tonight and at dinner Andrew announced that he had a factoid to share. Once he had our attention he informed us that if you cook peanut butter for long enough it will turn into a diamond. When asked where he heard that he said that it had to be right because he read it in a book at school entitled, "Weird But True." There you have it. Get to baking. Andrew: Thomas, your middle name is Luke. Thomas: No, my name is Thomas. Andrew: Your first name is Thomas. Your middle name is Luke. You know how you can remember that? It's like Luken Logs. Me: Do you mean Lincoln Logs? Andrew: Oh. Yes. Never mind. Thomas: Mommy, stop PLEASE, I really want to see that bus. Me: It's just a bus, Thomas, let's look as we run. Thomas: No, it's not a regular bus. It has an upstairs. It's a double dipper bus. Yesterday afternoon, after not getting dressed until noon and not having left the house at 4 p.m., I suggested the kids get bundled up to play in our rapidly melting, hopefully last of the season, snow. They agreed it was a good idea and only had to take a bathroom break each while dressed in full snow gear. Victory! After about 30 minutes outside Andrew asked if I would get a rope and the sled so he could pull Thomas like a sled dog. That seemed like a good idea until Mark busted them heading up the deck stairs, sled in hand, to get a running start into the yard. Someone call Mensa. Spring Break is in effect for the one of us lucky enough to attend elementary school. Until last Friday I was feeling badly that Andrew wasn't going to have the kind of Spring Break I remember from my youth; either on a beach or just lounging at home doing nothing productive and enjoying the life of the sloth. That all changed when the message came home outlining this week's planned activities at his home away from his other school, aka home-away-from-home. We'll call it Spring Break Day Camp because this is certainly not simple daycare. We're pretty lucky. Things began with swimming at the Indoor Aquatic Center yesterday. It's difficult for parents to compete with the college students serving as tour guides for the week. I know I'm not as fun as teacher Jimmy, a college student who apparently really wowed the kids with his diving and bellyflopping prowess at the pool. And, I know I'm not as fun as Chavis who guided them through a rigorous round of sign-making and then took them to the Fieldhouse today to help send the 'Hawks off to OKC for a little something we call basketball. This afternoon they'll stage their own basketball tournament back at school, and tomorrow? Tomorrow they will be in the annual St. Patrick's Day parade downtown. I could have taken the afternoon off work so he could see the parade but I have no strings to pull to allow him to ride in the parade. I've been trumped. Bowling and the Natural History Museum will round out the week. Next year I'm going to take the week off work. And then see if I can attend Spring Break Day Camp too. I'm here to admit, and document, that I’ve been kind of in the weeds this week.The record books will report that the temps are warming and spring might actually arrive. Yet, for some reason, I've been in a mood. Andrew is excited about his upcoming Spring Break and I find myself focused on how expensive the extra days of care are and wondering how come I don’t get a Spring Break. We have a gorgeous refrigerator, that you might recall I’m quite literally in love with, yet I can only gritch about the non-functioning water dispenser and how I hate Whirlpool and the man who came to deliver the bad news. The hours of daylight are growing and all I can think of is how there is still too much laundry to wash and too many meetings to attend and too many groceries to procure and not enough hours to get it all done. I'm not proud of any of this…just aware. I have been a real ray of sunshine, I tell you. Today ushered in another dark and drizzly sky, which is so good for our trees and about-to-emerge daffodils but not so good for my funk. I found myself driving the boys to school complaining about the rain and the fact that it was colder today than yesterday, which seems like an unfair backwards slide. I was pretty much just stewing in my own self-concocted miserableness. As I drove to work, already dreading things that hadn't yet happened, I was about halfway to my destination when I pulled up behind a yellow Volkswagen Beetle. I did a double take and then said, out loud, "Skittles Slugbug." I was that person clearly talking to myself at a stoplight. We began playing the Slugbug game many moons ago, calling it out whenever one of us sees a VW bug. For obvious reasons we had to cut out the part of the game where we actually slug a fellow passenger, but the boys still like to be the first one to call it. Then, a few months ago, some friends were riding in the car with us and taught the boys the Skittles game where you call out "Skittles!" each time you encounter a yellow car. The boys asked if we could do that and I encouraged it, because, really. How often do you see yellow cars? ALL THE FREAKING TIME, it turns out. Mark and I quickly tired of the Skittles game but there was no going back. We now just have to grit our teeth and ignore the cacophony of shouts that come each and every time we cross paths with any car of the yellow persuasion and the accompanying fight about who saw it first. So there I am, alone in my car, calling out Skittles Slugbug!, and smiling about it, even though I'm in a mood. The light turned green and I proceeded through the intersection and around the corner toward my office. As I rounded the bend, a car pulled out in front of me. As quickly as I started to feel my blood pressure rise because this genius had pulled out in front of me, I realized the car was yellow and found myself SHOUTING "Skittles!" Then I laughed loudly, because what else do you do when you realize you're the crazy grumpy lady playing the Skittles game all by yourself. I pulled into the parking garage at work and headed to my usual spot on the third floor, passing not one, but two yellow cars on the way up the ramps. Feeling as though I might be on Candid Camera, I had no choice but to continue laughing. Someone was throwing yellow cars in my path to entertain me. And you know what? It was working. I found myself thinking that yellow cars are pretty cheery looking. It continued to rain all day and the sky got darker rather than lighter. I am still, admittedly, a little less than cheery. But, the refrigerator appears to have healed itself for tonight and I'm thinking that a few more yellow cars thrown in my path just might do the trick. I'm going to have my eyes wide open tomorrow on the lookout. The moral of all this is to never underestimate the restorative powers of looking at the world through the eyes of two small boys and to never, ever underestimate how good it can feel to be that person yelling to no one in particular as you navigate the morning commute. This tooth fairy is going to need to take out a loan. 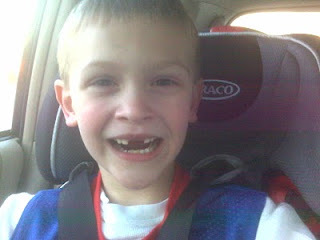 It has been a busy week in the exchange-money-for-tooth business. We might also need speech therapy because there's a good bit of lisping going on tonight. This very biased mother thinks he looks adorable.